4) Package: The brush come with a pvc cover for the bristles,and the whole brush come with a pvc tube. 1. The painting brushes can be cleaned with water immediately after painting with water-based pigment, but if it is long time hardening water-based pigment or oil color, then you must use brush cleaner to make it clean. 2. Washing the brushes with special makeup cleaner, then sucking water by dry towel. 3. Shaping the brushes hair into an ideal form, put it flat on the shade and air drying. 4. Don't dry it with blow dryer, avoid pulling and cutting brushes hair. 5. It wouldn't affect brushes usage if there is Slight depilation phenome. Ideal for Acrylic Nails,professional and perfect nail tools for your nail art design. Comfortable and easy to handle,perfect for both professional use and personal use! 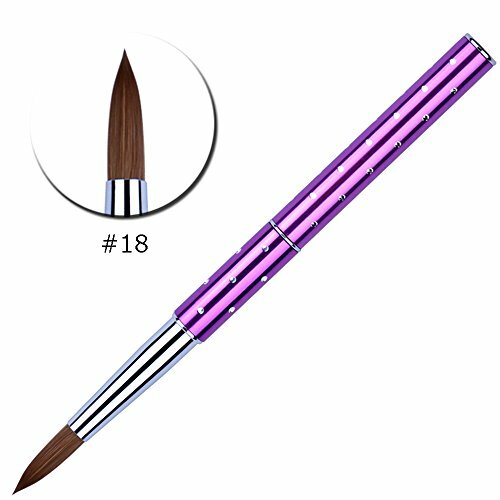 Outstanding Designs: Purple metal handle,luxury looking,this brush is removable and the cap of brush can protect the bristles very well. Manufacturer: Nanchang Yichayuan Technology Co., Ltd. Publisher: Nanchang Yichayuan Technology Co., Ltd. Studio: Nanchang Yichayuan Technology Co., Ltd.
View More In Nail Brushes. If you have any questions about this product by Ycyan, contact us by completing and submitting the form below. If you are looking for a specif part number, please include it with your message.